We don't think this is something you were really waiting for, but you can now use your expensive Canon or Nikon lenses on your iPhone. It won't get you any better image quality, but it does give you a different reach and use of small depth of field. 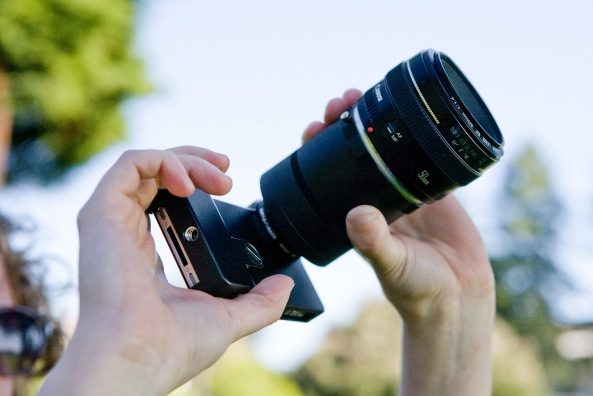 To connected your existing dslr lenses to your iPhone you can now buy an adapter with a Nikon or Canon mount. Using this special sleeve and adapter you can use all existing lenses of both brands. You will have to use manual focus. The aperture is another thing you will have to do manually. Most modern lenses do not allow for manual aperture changes, so you might just be limited to shooting wide open. You can order the new gadget at Photojojo; a site that brings gadgets for photographers on (almost) daily bases. There are four flavors available; the Nikon and Canon version for either an iPhone 4 or an iPhone 3. For the older iPhone version you'll pay 190 dollar. The case for the iPhone 4 will set you back 249 dollar.